Morbid Anatomy: Morbid Anatomy Library on Fox News. Yes, Really. Morbid Anatomy Library on Fox News. Yes, Really. A few weeks ago, Fox News (yes, THAT Fox News) sent over Red Eye host Bill Schulz and former medical examiner of New York Dr. Michael M. Baden for a little filmed visit to the Morbid Anatomy Library. In the course of our time together, we talked about phrenology, body snatching, and mummification. In addition, the very knowledgeable Dr. Baden conducted a thorough and pretty fascinating forensic examination of the newest addition to the library: an early 20th century human skeleton medical preparation, seen in the screen shot above. 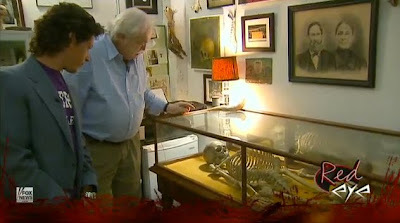 You learn all about the skeleton--and watch the segment in its entirety--by clicking here.